-February 27, 2019 (Wed), 7 PM; The Green Pavilion, 4307 18th Avenue, Brooklyn, NY; with Brad Vogel. -February 15, 2019 (Fri); 7-9 PM; Saint Illuminator's Armenian Apostolic Cathedral, 221 East 27th Street, New York, NY; World Without Walls reading sponsored by the World Poetry Movement and the Armenian Poetry Project; free. -February 10, 2019 (Sun); 3 PM; Suite Bar, 992 Amsterdam Ave, NY, NY; Launch of John Marcus Powell's book Veil On, Veil Off (Exot Books); no cover. -February 7, 2019 (Thu); 7-9 PM, NYWW@Red Room, KGB Bar, 85 E 4th Street, NY, NY; no cover, two-drink minimum. -November 3, 2018 (Sat); 4 pm, Downtown for Democracy reading; Jeffrey Deitch, 18 Wooster Street; NY, NY; free. -October 7, 2018 (Sun); 7 pm; Evergreen Review reading, KGB Bar, 85 E 4th Street, NY, NY; free. -July 22, 2018 (Sun); 6.30 pm; Beyond CIMO reading, UltraSuperNew, 107 Rowell Road, Singapore. -July 20, 2018 (Fri); Pink Dot 10 reading, Dorothy's Bar, 13A Trengganu Street, Singapore; free. -September 13, 2017 (Wed); 8:30 pm; The Inspired Word, with Deborah Emmanuel and Josh Lefkowitz, at Hell Phone, 247 Varet Street, Bushwick, Brooklyn, NY. -September 12, 2017 (Tue); 8:30 pm; The Singapore Collective at The Inspired Word, with Deborah Emmanuel and Jane Ormerod, at Parkside Lounge, 317 E Houston Street, New York, NY. -September 9, 2017 (Sat); 1 pm; launch of OF ZOOS issue "Faithless Translation" co-presented by Singapore Unbound and National Translation Month, TriBeCA, NY; free. -July 20, 2017 (Thu); 1:30 pm; reading for Humanities Program at Raffles Institution, Bishan, Singapore. -July 15, 2017 (Sat); 6 pm; The Japanese Influence on Singapore Literature, with Cyril Wong and Daryl Yam; BooksActually Bookstore, 9 Yong Siak Street, Singapore; free. -July 13, 2017 (Thu); 7 pm; Reading Goh Poh Seng's Lines from Batu Ferringhi; Artistry Cafe, 17 Jalan Pinang, Singapore; free. -May 20, 2017 (Saturday); 5 pm; Reading at St. Edmund's Hall, Oxford University, Oxford, UK; free. -May 2, 2017, (Tue); 7 pm; Louffa Press reading at Book Culture, 536 W 112th Street, New York, NY; free. -January 31, 2017 (Tue); 7 pm; New York Writers Workshop for The Inspired Word at Parkside Lounge, 317 E Houston Street, New York, NY. -October 16, 2016 (Sun); Split This Rock's Sunday Kind of Love reading, at Busboys and Poets, 2021 14th St NW, Washington, DC; $5, tickets at door. -September 17, 2016 (Sat); International Voices, organized by National Translation Month, Sidewalk Bar & Restaurant, 94 Avenue A, New York, NY, with Akram Alkatreb, Alexander Cigale, Gil Fagiani, George Held, Houssam Jeffee, Valery Oisteanu, and Larissa Shmailo; free. -August 23, 2016 (Tue); Nanyang Technological University Writing Program's Lunchtime Series, Singapore; free. -July 20, 2016 (Wed); Singapore Unbound: The Transgressions Reading, with Cyril Wong, Ovidia Yu, and Tania De Rozario, Booktique, Singapore; free. -July 9, 2016 (Sat); 7 pm; Singapore Unbound: Writing, Reading, and Publishing Overseas, with Alfian Sa'at and Ovidia Yu, co-organised by Singapore Literature Festival in NYC and Gallery & Co, National Gallery Singapore, The Glass Room; free. 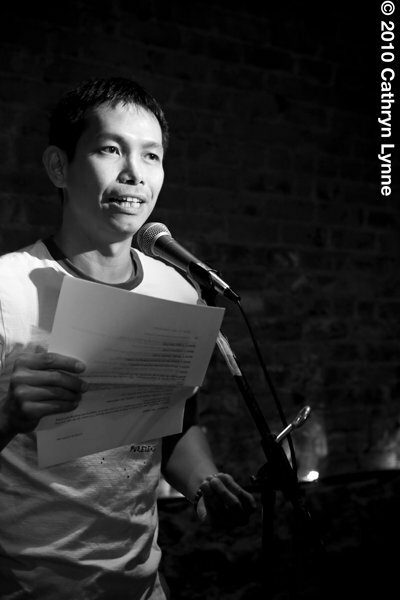 -June 21, 2016 (Tue); Kundiman at Word for Word reading, at Bryant Park Reading Room, with Patrick Rosal, Janine Joseph, and Franny Choi; free. -May 4, 2016 (Wed); 6:30 pm; Lambda Finalists reading, Leslie-Lohman Museum of Gay and Lesbian Art, NYC; free. -March 28, 2016 (Mon); 7 pm; Visiting Poets Series, San Francisco State University, 1600 Holloway Ave, San Francisco, CA 94132. -March 26, 2016 (Sat); 7 pm; Nomadic Press Reading, 2926 Foothill Boulevard, Oakland, CA 94601, with Soma Mei Sheng Frazier; donations. -March 24, 2016 (Thu); 7 pm; Modern Times Bookshop, 2919 24th St, San Francisco, CA 94110. -March 17, 2016 (Thu); 7 pm; The Wilderness Party at Book Culture Bookstore (near Columbia); with A. B. Jackson, Cate Marvin, and Jane Ormerod. -March 13, 2016 (Sun); 2 pm; Queens Library (Central), 89-11 Merrick Blvd, Jamaica, NY. -March 6, 2016 (Sun); 3 pm; Carmine Street Metrics Reading at Otto's Shrunken Head, NYC; with John Foy; free with open-mic. -March 1, 2016 (Tue); 12:30 pm; The Nick Virgilio Reading Series at Rutgers-Camden University. -February 16, 2016 (Tue); 6 pm; HIV/AIDS Here and Now Project at Kinokuniya Bookstore, NYC. -January 14, 2016 (Thu); 8:00 pm; The Inspired Word at Parkside Lounge, NYC. -December 15, 2015 (Tue); 7:30 pm; Risk of Discovery Reading at Astoria Coffee, NYC. -November 23, 2015 (Mon); 7 pm; Union anthology reading at the Asian American Writers' Workshop; with Rachel Hadas, Rand Richards Cooper, Sabina Murray, Stephanie Strickland, Gregory Pardlo, Christine Chia, and Amanda Lee Koe. -November 21, 2015 (Sat); 7 pm; Oh Bernice reading series; The Astoria Bookshop; with Jenna Telesca and Catherine Lacey; free. -November 21, 2015 (Sat); 3 pm; Irish N. & Friends: A Benefit for 5C Cultural Center & Cafe; with Madeline Artenberg, Elisa DeCario, Thomas Fucaloro, Mark Larsen, Brenda Morrise, Mireya Perez, Iris N. Schwartz, Trudy Silver, Sheryl H. Simler, Robin Small-McCarthy, Miriam Stanley, Susan Tepper and Fran Witte; donation. -November 18, 2015 (Wed); 7 pm; The Brearley Book Festival, with William Finnegan, Kenneth Fisher, George Hagan, Josh Lieb, Martha Mendelson, Janie P. Nimura, and Rachel Urquhart. -November 5, 2015 (Thu); 7 pm; Brooklyn Poets reading series, Smack Mellon, 92 Plymouth Street, DUMBO, Brooklyn; with Rickey Laurentiis and Mahogany L. Browne; free. -October 31, 2015 (Sat); Singapore Writers Festival; 10 am: "Raising the Profile of Asian Literature," and 2:30 pm: "Getting Published Overseas"; The Arts House, Singapore; ticketed events. -October 30, 2015 (Fri); 6 pm; Singapore Launch of Steep Tea, Booktique Bookshop, CityLink Mall, Singapore; free. -October 24, 2015 (Sat); 7 pm; Under the Sign of the Bear reading series, Classic Lines Books, Pittsburgh, USA; with Jason Irwin; free. -October 17, 2015 (Sat); 6 - 8 pm; New York launch of Steep Tea, Book Culture Bookshop, near Columbia University; with Cindy Arrieu-King; free, with reception. -September 30, 2015 (Wed); 5 pm; Singapore Symposium at NYU, venue tba; free. -September 27, 2015 (Sun); 5:30 - 6:30 pm; "Literary Conversations: Celebrating Union," part of Singapore Inside-out, Madison Square Park, NYC; with Alvin Pang and Ravi Shankar; free. -September 26, 2015 (Sat); 1:00 - 3:00 pm; Outback Reading series hosted by Nomadic Press, at Black Brick Coffee, 300 S Bedford, Brooklyn, NY; with writer and comic artist John Dermot Woods, and musician Marcin Wisniewski. -September 21, 2015 (Mon); 4 -5 pm; "International Literature: Singapore Literature" organized by MANOA journal, Library of Congress, James Madison Building, Mumford Room; with Jeremy Tiang and Frank Stewart; free. -September 13, 2015 (Sun); 7 - 9 pm; "Take Out, Take Home: Footloose Writers on Food and the Sense of Belonging," literary arts event of Something To Write Home About, NYU Kimmel Center (KC405); with Amanda Lee Koe, Jeremy Tiang, Colin Goh and Yen Yen Woo; free. -July 17, 2015 (Fri); 8 pm; Desperate Literature Bookshop, Madrid, Spain. -July 7, 2015 (Tue); 7 pm; London Review Bookshop, with Rebecca Watts, Joey Connolly, Vahni Capildeo and John Clegg, and introductions by Michael Schmidt; 10 sterling pounds. -July 3, 2015 (Fri); 7 pm; Edinburgh launch of Steep Tea; The Sutton Gallery, Edinburgh, UK; with Janette Ayachi, Tessa Berring and Rob Mackenzie; free. -July 2, 2015 (Thu); 8 pm; Albion Beatnik Bookshop, Oxford, UK; with Kiran Millwood Hargrave and Julie Bolitho-Lee; free. -June 23, 2015 (Tue); 7 - 8:30 pm; PrideWriters: Reading to Benefit New Alternatives; The Duplex upper bar, 61 Christopher Street, NY; with Kevin Scott Hall, Sissy van Dyke, James Gavin, Ricardo Hernandez, and Kate Walter; donation. -June 14, 2015 (Sun); 7 - 9:30 pm; Others Will Enter the Gates: Immigrant Poets on Poetry, Influences, and Writing in America; (le) poisson rouge, 158 Bleecker Street, NY. -June 6, 2015 (Sat); 7 - 8:30 pm; Assaracus reading, Bureau of General Services-Queer Division, at the LGBT Community Center in NYC; free. -May 8, 2015 (Fri); 7 - 8:30 pm; Bureau of General Services-Queer Division at the LGBT Community Center in NYC; reading with John Marcus Powell; free and open to all. -Apr 2, 2015 (Thu); 5 - 7 pm; Vassar College, Faculty Commons, organized by the Southeast Asian Student Association, Wordsmiths, and the Asian Studies Department; free and open to all Vassar students, faculty, and staff, with reception. -Mar 7, 2015 (Sat); 7 - 9 pm; Singapore Literature Prize event at The Book Cafe, organized by the National Book Development Council of Singapore and the Singapore Writers' Group; free. -Mar 4, 2015 (Wed); 2 - 4 pm; poetry workshop with Dunman High, organized by the National Book Development Council of Singapore. -Feb 1, 2015 (Sun); 2 - 4 pm; Langston Hughes Birthday Party, sponsored by POPLab and hosted by the Urban Yoga Foundation in Harlem; with dancer Johari Mayfield, actor S. Brian Jones, and poet Robert Gibbons; with open-mic; $5, proceeds going to UYF. -Jan 10, 2015 (Sat); 7 - 9 pm; New York launch of A Luxury We Cannot Afford, Yumcha Yoga Studio, Flushing, NY; with Christine Chia, Damon Chua and Jeremy Tiang; with open reading; free but RSVP required. -Nov 16, 2014 (Sun); 4 - 6 pm; Kundiman and Verlaine Reading Series, Verlaine Bar & Lounge; with Jay Deshpande, Sandra Lim and Keisuke Tsubono; with open-mic; $5 suggested donation. -Oct 19, 2014 (Sun); 7 - 9 pm; Bureau of General Services-Queer Division, LGBT Community Center; with Eduardo Martinez and Adam Fitzgerald, curated by Eduardo Corral; free. -Sep 13, 2014 (Sat); 8:15 - 9:00 pm; launch of Starry Island: New Writing from Singapore, at St. Mark's Bookshop, part of Manhattan Lit Crawl; with Jeremy Tiang and Amanda Lee Koe; free. -Aug 13, 2014 (Wed); 8:00 - 10:00 pm; launch of Japanese translation of The Pillow Book at The Arts House, Singapore; with translator Keisuke Tsubono and Awai Books publisher Matthew Chozick; free. -Aug 3, 2014, (Sun); 7 pm; launch of Japanese translation of The Pillow Book at Editory, Tokyo, Japan; with translator Keisuke Tsubono and illustrator Mariko Hirasawa; free. -July 26, 2014 (Sat); 7:30 - 9:00 pm;"An Evening with Koh Jee Leong" at BooksActually, Singapore; free. -July 23, 2014 (Wed); 8:00 - 10:00 pm; Speakeasy reading series at Artistry Cafe, 17 Jalan Pinang, Singapore; with Gwee Li Sui; free. -Apr 10, 2014 (Thu); 7:00 - 9:00 pm; Bureau of General Services--Queer Division, Hester Street, NY; with Charlie Bondhus, Steven Cordova and Walter Holland; free. -Apr 3, 2014 (Thu); 7:00 - 9:00 pm; ALSCW conference at Bloomington, Indiana, opening night; with Greg Delanty, John Burt, Kevin Tsai; free. -Mar 29, 2014 (Sat); 1:00 - 2:00 pm; Come Hear! poetry salon, Rainbow Book Fair; free. -Mar 8, 2014 (Sat); 7:00 - 9:00 pm; Second Saturdays reading series; 86th Street, NY, NY; with Christine Chia, Paul Rozario-Falcone, Damon Chua, Eric Norris, Kimberley Lim, and Jeremy Tiang; private gathering. -Nov 13, 2013 (Wed); 10:10 - 11:40 am; Hunter College, Alison Park's Asian American Studies class. -Oct 5, 2013 (Sat); 11:00 am - 12:00 pm; Kundiman Marathon Poetry Reading, at Page Turner: the AAWW Food and Books Fair, YWCA Community Room, Brooklyn; with Michelle Chan Brown, Cathy Linh Che, Evan Chen, Vanessa Huang, Cynthia Arrieu-King, Sally Wen Mao, Alison Park, Purvi Shah, R.A. Villanueva; free. -Aug 31, 2013 (Sat); 5:30 pm; book launch of "This Assignment Is So Gay: LGBTIQ Poets on the Art of Teaching," Decatur Book Festival, Decatur, Georgia; free. -Jul 13, 2013 (Sat); 3-4 pm; Select Books, 51 Armenian Street, Singapore; with Cyril Wong and Christine Chia; free. -May 4, 2013 (Sat); 7-11 pm; Reading at Two Moon @ Two Moon Art House & Cafe, 315 Fourth Avenue, Brooklyn, NY; with Jason Irwin and Jennifer Harmon; donation. -Mar 2, 2013 (Sat); 2-4 pm; Phoenix Reading Series @ the Yippie Museum Cafe, 9 Bleecker Street, New York, NY 10012; with Sarah Sarai; limited open reading; donation. -Jan 18, 2013 (Fri); 7-10 pm; opening reception for Brural: Peripheral Vision, the Active Space, 566 Johnson Avenue, Brooklyn, NY; free. -Jan 13, 2013 (Sun); 5-7 pm; Reading Queerly! ?, Pink Pony Cafe, 176 Ludlow Street, New York, NY; free; with open-mic. -Oct 16, 2012 (Tue); 7-9 pm; Deadly Chaps reading, Envelope Project Space, 164 Orchard Street, New York, NY 10002; free. -Aug 10, 2012 (Fri); 7:30 pm; launch of chapbook The Pillow Book; Books Actually Bookshop, Singapore; free. -Aug 4, 2012 (Sat); 7:30 pm; New Word Order series; the Arts House, Singapore; free. -May 15, 2012 (Tue); 6 pm; Face to Meet Other Faces anthology reading, Cornelia Street Cafe, NY, NY; $7.00. -May 7, 2012 (Mon); 7 pm; Divining Divas anthology reading, Barnes & Noble, 82nd and Broadway, NY, NY. -March 24, 2012 (Sat); 1-2 pm; Rainbow Book Fair, LGBT Center, NY, NY. -February 1, 2012 (Wed); 7 pm; William Carlos Williams Poetry Cooperative, The Williams Center, 1 Williams Plaza, Rutherford, NJ 07070. -October 2, 2011 (Sun); 6 pm; Carmine Street Metrics, Bowery Poetry Club. -September 27, 2011 (Tue); 6 pm; Boog City Newspaper hosts Poets Wear Prada at ACA Galleries, NY, NY. -July 23, 2011 (Sat); 5 pm; Tribes 13 Release Party, Poets' House, NY, NY. -June 16, 2011 (Thu); 7:30 pm; Books Actually Bookshop, No. 9 Yong Siak Street, Tiong Bahru, Singapore. -May 28, 2011 (Sat); 5 - 6:30 pm; American Literature Conference/ Circle of Asian American Literary Studies, Westin Copley Place Hotel, Boston. -May 21, 2011 (Sat); 10:15 AM; Conference of the Association of Asian American Studies; Sheraton New Orleans Hotel, New Orleans. -May 14, 2011 (Sat); 3 - 4:30 pm; Massachusetts Poetry Festival; Peabody Essex Museum, Salem. -April 15, 2011 (Fri); 6 - 8 pm; Cornelia Street Cafe, New York, NY; $7.00; open-mic. -March 26, 2011 (Sat); 11 am - 5 pm; LGBTQ reading Come Hear! at Rainbow Book Fair; New York City LGBT Community Center. -November 3, 2010 (Wed); 7:00 PM; Alumni reading; Sarah Lawrence College, Slonim House, New York, NY; with Ron Egatz, Rachel Eliza Griffiths, and Jean Hartig.